This is the second module of the Simple Education Essential Guide to Coronary Angiography, Stenting and Structural Intervention course (4 module series). This module covers The Chest Pain Patient in 12 easy to digest on-demand lectures. 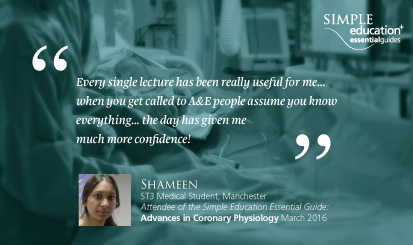 Lectures are all delivered by leading interventional cardiologists, and are designed to take you through what you need to know to feel confident in getting to grips with managing patients presenting with chest pain. The Simple Education Essential Guide to Coronary Angiography, Stenting and Structural Intervention has a refreshing style, and is innovative in format comprising short lectures all filmed with HD and is centred on real cases and video demonstrations.